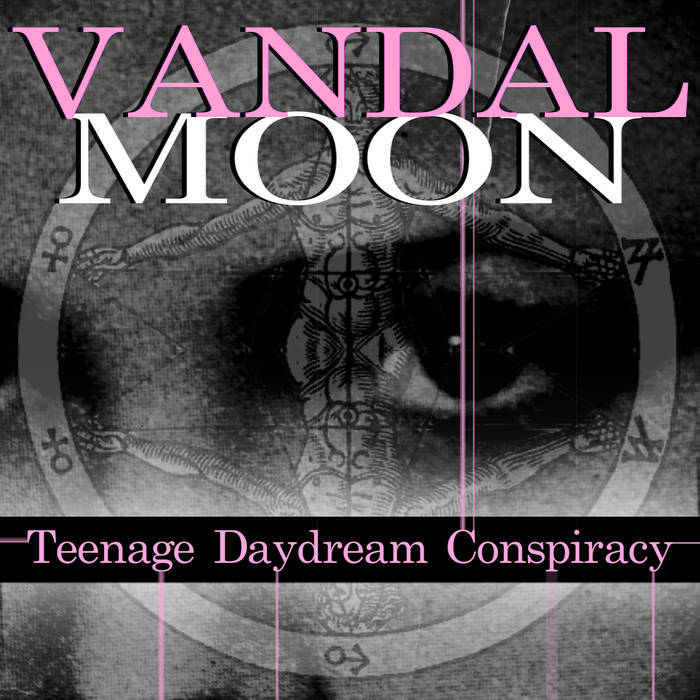 Vandal Moon takes us on a journey to when we were all teenagers. We may regret some things we did back then, but this album is not one of them. Well, this will surely be the most unusual album I’ll ever review. There is a clear difference between Darksynth and Darkwave, Darksynth is the usual synthwave soundtrack stuff, Darkwave is essentially a dark/punk version of new wave. To be honest, I love both to death. I love 80’s horror soundtracks, I love punk wave stuff, like The TCR and in this review, Vandal Moon. Blake Voss started the Vandal Moon project, being the only member of said project, and in 2014, came out with one of the best rated EP’s of the year, “The LSD EP”. It was a trippy and unregretful experience to listen to it, and it never gets old. However, unlike the aforementioned EP, this album is about age. “Teenage Daydream Conspiracy” was released 10 days ago on Werkstatt Recordings (I’ve enjoyed the Purgatory cassette, thanks), and the album is definitely a trip. “Today You Are A Child” is the first track on the album and to me, it’s my second favorite on the album. It gives me a feeling and reminder of bands like Pearl Jam and Creed, very grunge-like bands. It’s mysterious and brooding, with the lyrics saying things like “we all love you” and “today you are a light”. It’s very dark in nature, and it adds to the supposed daydream conspiracy the album gives off. The next track features a nu-romantic artist named Logan Sky called “Digitalmerica”. It shows how we as a continent and nation have all connected through telephone wires and technological clouds raining only hatred spread across a spider’s web. It speaks without pandering to a demographic, the demographic speaks for it. Another collaboration track after that features the artists Die Huntress and Neglectic on “Dream Lover”. Once again taking cues from cool coldwave bands like The Cure and rock bands like The Chameleons. It’s very beautiful to listen to, possibly like the girl of your dreams , or maybe the opposite, the girl who dreams of you. “Heart Attack” adds more onto the story of a teenager in a repressive society that we’ve created, our own struggles affect everyone and this teenager was hurt by someone else’s heart getting in his way of life. Death’s sweet release does not care about age, gender, race, preference, or anything, but I never expected Death to say things like “you are not the one I adore”. “Pyromania” gets more new wavey right after the tragic tale of love and death, we get emotional fire. This one reminds me of David Bowie, god rest his eternal soul, it’s very amazing how well you hear one thing in another, unlike seeing Jesus in a piece of toast. Next is “Revelation Celebration” featuring Amberotica, so this song is like a mini-duet. This one sounds the most like old Pearl Jam tracks with a pop feeling, songs like “Jeremy” (COINCIDENCE). It’s still very amazing to listen to. “Can’t Feel” follows right after that, getting more into the darkwave sound again, and it sets the mood for the rest of the album after that. “Romance Demonology” follows right after as track eight, and is accompanied by an acoustic guitar, and follows a lost tale of love and loss, not in death, but in life. The lyrics are beautiful and descriptive, adding the title in there without name dropping it once, speaking of gardens and romance and demons. “Blame It On The Weekend” is like your parents discovering you were at an underground party or concert, describing the days before Saturday and Sunday, as “I know what I’ve got to be” is one of the starting verses, and adds more to a story not told indescreetly. “Robert Smith (I Love You Since I Was Six)” is a different mood compared to previous songs, being more upbeat and pop-like, like classic bands like Tom Petty, with vocals of The Cure mixed in. With the pulsating guitar and rhythm in the background, giving it a clean yet distorted feel. “Lonely Never” is the third-to-last song on the album, and adds a more grunge-like aesthetic to the feeling of it, mixing in with themes of passion, discretion, privacy, controlled thought, and death. You’re never lonely in death as this tale’s character acknowledges, and death is his supposed only way out. Oh, if only there were someone to be together with. “Father” is the twelfth track, and the hardest hitting on the entire album, the reverb pounding and breaking all barriers. The tone even breaks it apart, as it’s some kind of tale about either abuse or never having a father figure, the kind of song your guardians would get mad at you for listening to, songs in movies like “Class Of 1984”. Finally, the thirteenth track, and my favorite song on the album named “Little Toy Soldier”. The man behind Vandal Moon describes it as his attempt to be Sinead O’ Connor, and it is a hailing achievement of Darkwave in 2016. It’s soft, melodic, the lyrics even drowning out the actual music at points in it, and speaking of the lyrics, my word they’re very well done. I believe the song title is in reference to the way teenagers are treated, always being told things and made to do things they have no interest in, while also referencing the way they disobey orders explicitly and dive into danger headfirst. This album is a journey of all of life’s feelings as a teenager, and doesn’t necessarily speak to the teen demographic. It doesn’t have to be like something to be it. It works on so many levels, and this is definitely one of my favorites. Godspeed.